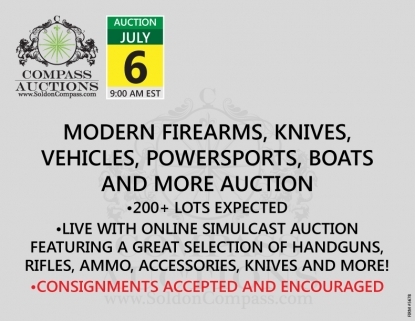 Compass Auctions & Real Estate will host an LIVE with ONLINE SIMULCAST Modern Firearms and Equipment auction event on July 6, 2019. This auction is currently slated to begin at 9am EST and will feature 200+ lots of handguns, rifles, knives, accessories, ammunition and more! Consignments are accepted and encouraged for this auction, please contact a Team Compass member if you have any questions or items for consignment.